HOME FAQ LINKAGE NEW FROM JAPAN LOTS OF INFO! NEVER ANY ADS! Toonami made some schedule changes you may have noticed this past weekend (if you were watching). 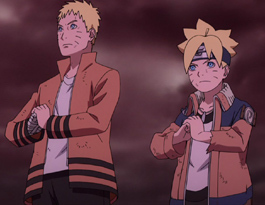 Boruto has moved down to the 2:00am slot just before his father, Naruto, which airs at 2:30am. My Hero Academia has taken the 11:30 slot. 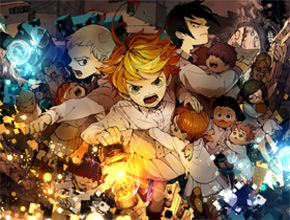 The 1st episode of The Promised Neverland debuted at 12 midnight. Kirito, Jojo, and Asta (if you watch the shows, you'll know which ones I'm referring to) remained in their time slot. See the schedule below. Images/Highlights of Beyblade Burst GT episode 1. Images/Highlights of Beyblade Burst Turbo / Super Z ep 21. Images/Highlights of My Hero Academia Episodes 44. Images/Highlights of Sword Art Online:Alicization ep 14. Images/Highlights of Zoids Wild episode 32. Please continue to vote on the existing poll. Thanks a lot! 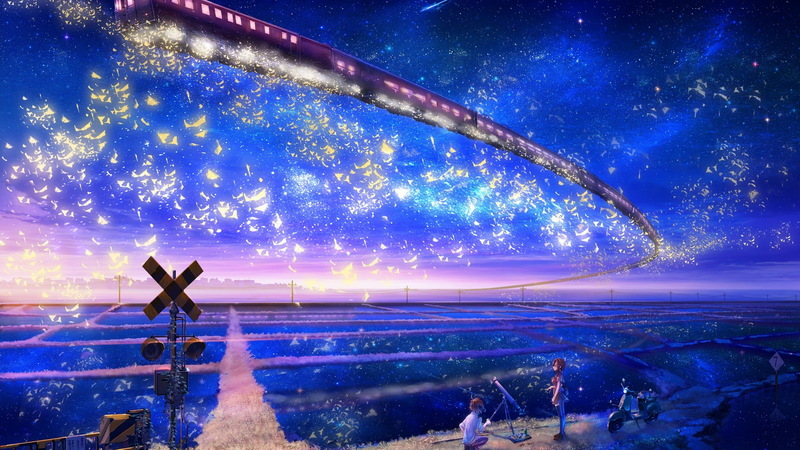 Last poll--People get their anime from--'Other'--Streaming?? 11:00pm Dragon Ball Super:Revenge "F"! A Cunning Trap is Set? We'll start with Toonami; Megalo Box is ending, and to my surprise, The Promised Neverland is filling that gap. Set to air on April 13th, this series is a tale of Orphans against demons. You're not going to want to miss an episode of this thrilling show. I was going through the schedules of some of my favorite channels, and what do I see? Right after Beyblade Burst Turbo is two episodes of Inazuma Eleven Ares. If you are a soccer fan, then you will love this series. It is set to premiere on April 13th at 8:30am Eastern Time Zone. The Spring Season is upon us and my favorite site for Spring Previews have outdone themselves again. Great job Random Curiosity! Get a heads up of new Spring series by clicking on that link. Images of Bakugan Battle Planet episodes 15 and 16. Images/Highlights of Beyblade Burst Turbo / Super Z ep 20 & Avatars. Images/Highlights of My Hero Academia Episodes 41 & 43. Images/Highlights of Sword Art Online:Alicization ep 13. Images/Highlights of Boruto episode 24. What are you looking forward to most in Japan's upcoming Season? I've purchased my anime here and never had any problems.